The Indian Prime Minister called on all sides to work together constructively to find political and diplomatic solutions that protected the legitimate interests of all countries in the region. While addressing a meeting of the Russian parliament on the accession of Crimea to the Russia, Vladimir Putin thanked India for its tacit support and understanding Russian concerns. “We highly appreciate India’s restraint and objectivity,” the Russian President told the joint-meeting of the parliament. After the parliament session, Putin called up Manmohan Singh to brief him on the development of the crisis in Ukraine and “the implementation of an informed choice by the multiethnic population of Crimea, which was made during the March 16 referendum,” the Kremlin press service said. India did not clearly state an official position on the accession of Crimea. 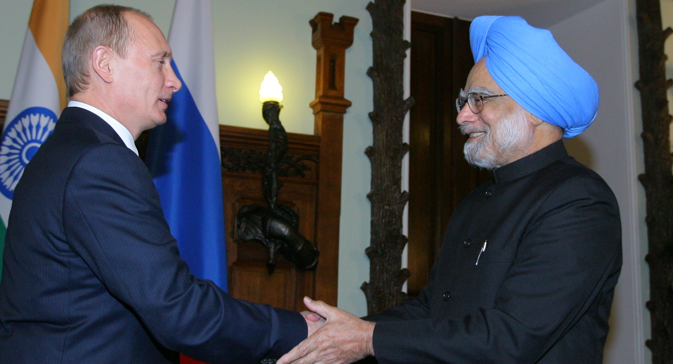 Manmohan Singh thanked President Putin for explaining the Russian position with regard to recent developments in Ukraine, the Indian Ministry of External Affairs said, adding that the prime minister emphasized the consistent position India had on the issues of unity and territorial integrity of countries. Singh “expressed his hope that all sides would exercise restraint and work together constructively to find political and diplomatic solutions that protected the legitimate interests of all countries in the region and ensured long term peace and stability in Europe and beyond,” the ministry said. A major part of the discussion addressed issues of trade and economic cooperation and ties in other areas, according to the press note. “Mr Singh expressed interest in promoting multidimensional cooperation, not just on a bilateral basis, but in multilateral formats as well, including through the Customs Union and the Common Economic Space,” the Kremlin press service said. Although India’s National Security Advisor Shiv Shankar Menon said Russia’s interests in Crimea were legitimate, India has not taken a strong position on the crisis. New Delhi refused to join the Western chorus in condemning Russia and also ignored requests from the Ukrainian ambassador to recognise the present regime in Kiev. However at the same time, Manmohan Singh’s response to Vladimir Putin during their phone conversation is an indication that India will not officially make a strong statement on the Crimean issue. Both Singh and Putin “expressed a firm determination to strengthen relations as a strategic, privileged partnership,” the Kremlin news service said.